It’s not getting any brighter…. A frontpage article in today’s (5/06/09) Republican newspaper (read the full story) paints a still gloomier picture of the state’s financial condition which could have a very large impact on Longmeadow’s FY09 and FY10 budgets. Here are some quotes from the article…. In an online Boston Globe article yesterday, it was reported that April state revenues were $456 million below expectations and the deficit for the remaining 3 months in FY2009 are now expected to drop $963 million below expections. According to Michael Widmer, president of the Mass Taxpayers Foundation, the state may need to use up to $800 million from state’s rainy day fund to balance the the current FY2009 budget leaving only $500 million for FY2010. Last week’s Town Meeting decision to vote on the FY2010 budget even though accurate numbers on state aid for Longmeadow were not available may not have been the right choice. At Town Meeting it was thought that because of revenue shortfalls, our FY2010 revenue would be $600,000 (or more) short of the FY2010 budget spending levels. Because it looked like FY2010 state aid was going to be reduced further and create an even larger deficit the Longmeadow School Committee recommended that we “adjourn” the vote on the FY2010 budget until the Town Meeting was reconvened on June 2 so that additional state aid information could be assessed and the FY2010 budget adjusted if necessary. If the Town Meeting voted and approved the budget on April 28, the Longmeadow School Department would have only two weeks (--> May 12) to issue potential “layoff notices” to teachers. June 2 was before the Annual Town Elections (June 9) so that the current town leaders (Select Board and School Committee) would be the making the needed budget corrections. In addition, there would be sufficient time before June 15- the latest date for teacher layoff notifications. While SelectBoard chairman Paul Santaniello was in favor of adjournment of the budget vote, the Select Board was split (Santaniello/Barkett --> favored postponing vote, Grady/Scibelli --> against postponing vote) so the Select Board did not have a recommendation for the Town Meeting to consider. Select Person Kathy Grady as well as a number of Town Meeting members felt that it was unlikely that even on June 2 there would not be much additional information on state aid and because we have $2 million in the Operational Stabilization Fund (aka “rainy day” fund) that we could use it if necessary to fund any town revenue shortfalls. The Finance Committee also supported the recommendation by the School Committee for adjournment on the budget vote. Chairman Mark Barowsky also emphasized that the town should not be so quick to count on the Operation Stabilization Fund because it was his opinion at that time that the state’s financial condition and funding for FY2009 and FY2010 was going to continue to worsen. I have been writing about this impending financial crisis since early January (see 1/16/09 post- A Financial Tsunami is Heading Toward Us! and things have only gotten much worse since then. At that time I asked “What are town leaders (Select Board/ Town Manager + School Committee) doing right now to prepare for the tsunami wave that has already been formed in Boston and is heading west towards us? Comment: It would appear that we have experienced additional financial “aftershocks” in Boston and a financial tsunami is still heading our way! Despite the uptick since March in the stock market and calmer financial markets, it is likely that unemployment will continue to increase (a lagging indicator of the economy) and state + local revenues will continue to erode for some time- probably well into 2010. It seems to me that prudent fiscal policy for Longmeadow would be to use the Operational Stabilization Fund only as a last resort. If FY2010 appears to be a difficult year, FY2011 may be even worse and it would be prudent to have some remaining financial resources to soften any hardship. A couple of additional issues…. 1. There are no cost of living adjustments (school or town employees) included with the FY2010 budget that was voted at last week’s Annual Town Meeting. With both town employee and school department teachers contracts expiring in June and August, there is a potential increase in overall costs of $300,000 with every % increase in COLA. 2. Based upon what I heard at the town meeting, it would appear that next Tuesday, May 12 (also the Select Board preliminary run-off election) is the last day for the School Department to issue layoffs notices. If there are none issued, there can be no teacher layoffs in FY2010. A couple of questions for our town leaders…. 1. When will the collective bargaining agreements with the teachers union as well as the fire and police unions be signed? Will they include any cost of living adjustments? 2. Given all of the FY2010 budget uncertainties, will there be any teacher layoff notices issued before the May 12 deadline? 3. How do you plan to balance the FY09 and FY10 budgets? Are we going to simply use the “rainy day” fund and not worry at this time about future financial revenue shortfalls? Tonight is the Select Board forum at Glenbrook Middle School (7 PM) in which eight candidates currently running for Select Board will be participating- three of which will be elected and be deeply involved with our FY2009 and FY2010 budget problems. Take the time to attend the meeting, ask a question or simply watch the broadcast on LCTV. See the event notice for additional information on this important forum. 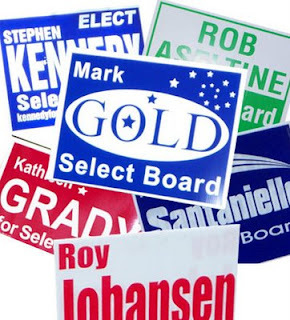 The look of election campaign signs is pretty predictable as shown below in a sampling of the current group that are now appearing on front lawns around town. 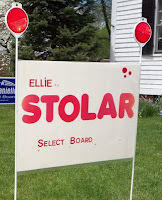 According to Eleanor Stolar these signs are made from recycled campaign signs, a little bit of spray paint and some creative genius by a campaign worker. "I said I would not spend any money ( mine or anyone else's)... my friend (Janet) had an old sign and she re-painted it and put in front of my home, and so it began.. a few other people gave Janet old signs, different sizes and a painter gave her several cans of left over paints and she re-painted different colors and sizes. Janet as done a great job, each is a masterpiece!" "I think that there may be 12 or 15 out there. All are recycled .. I did purchase few cans of spray paint (white and black) from Home Depot @ 97 cents a can."